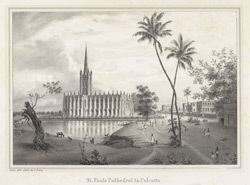 Uncoloured lithograph of St Paul's Cathedral in Calcutta by Frederick Fiebig published c.1847. The St Paul's Cathedral is situated on the south-east corner of the Maidan, a large open space at the heart of Calcutta. The cathedral was designed in the Gothic style by Major William Forbes of the Bengal Engineers, the architect of the Silver Mint in Calcutta, and consecrated in 1847. Although the spire of St Paul's Cathedral can be seen in this view, it collapsed in an earthquake in 1897. St Paul's Cathedral is now topped by a tower, which was built after a second earthquake in 1934. Fiebig also produced a 360 degree panorama of Calcutta in six parts in 1847 and he took many salt-print photographs of the city and its environs in 1851.